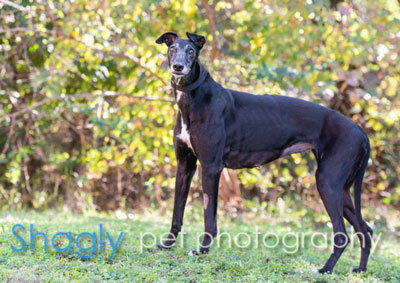 Erica, aka Flying Explosive, is a 7.5-year-old black female born April 4, 2011. Her sire is Dragon Fire and her dam is Flying Hall. Erica has 44 races on record in 2012 and 2013 in West Virginia and Florida. She went on to three litters of puppies from 2015 to 2017. What a career she's had! A home with no cats is a must for Erica. Erica has been a wonderful foster dog! In just a couple of weeks, she transitioned from being a wiggly athlete to a sweet, affectionate, loyal and playful pet. This girl is a cutie! She has an athletic build and a built-in tuxedo of a white chest and toes. Her ears often move in crazy directions and she has a helicopter tail that is constantly rotating because she is always happy. This smart girl house trained quickly (8 hours) and soon learned that items on the counter are not for her (although she will do a little counter viewing to see what is happening up there). She has never tried to get on the furniture – she is very content to just roach on her dog bed. Erica gets along well with our other dogs and is especially sweet to our crippled grey Gezabel who thinks she is the head of the household. One time our crippled girl even ate all the treats out of Erica’s bowl and Erica just sat back and let her. If you like a Velcro dog, this is your girl! Erica likes to be right by us all the time. When we work in the yard, she will get up next to us, or maybe even put her head between our legs, so she can get a close look at whatever working on. She is very curious about everything! 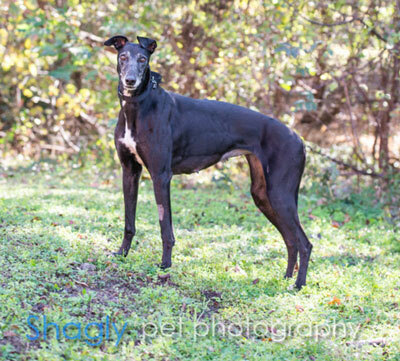 Erica has a lot of energy and when she runs laps around the backyard you can see why her racing name is “Flying Explosive” - our other greys can’t catch her! She loves “stuffies” and sometimes likes to take them into the backyard for a run around. She is very interested in squirrels and is constantly on the lookout for them. Erica will be a greyt addition to a cat-free family.